Your IT department structure is critical for ensuring that your business functions properly and your assets are protected. A poorly set up IT department will hinder your business but a well planned IT department will give you a competitive advantage in your line of business. Planning and properly setting up your IT department structure is an important step for your business's success. 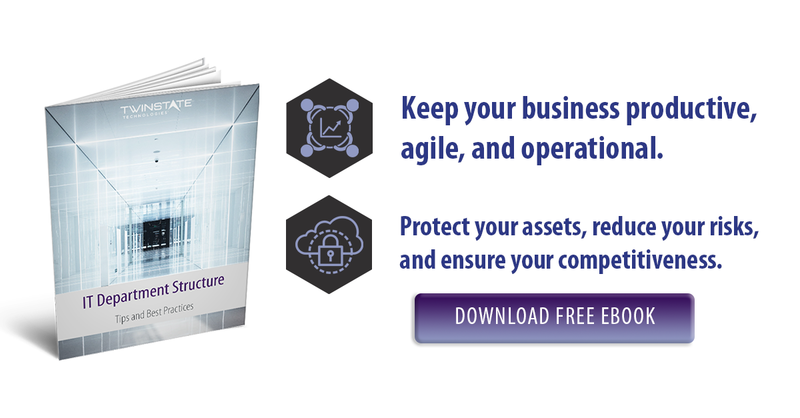 It is critical that your business has a proper IT structure in place to ensure functionality of your business, competitiveness in your arena, protect your assets, and reduce risk. As a business owner, you know how to run your company, but the thought of organizing your IT department can be overwhelming. The experts are here to help you. Consider the size of your business. Are you small (fewer than 25 employees), medium (25-75 employees), or large (greater than 75 employees)? In a small company of fewer than 25 employees, it is very typical for every employee to perform multiple jobs. In this case, simple day-to-day IT issues generally fall to the individual who has the highest technical aptitude in the organization. Elements necessary for appropriate levels of asset protection and IT security most commonly are hired like an external accounting firm. IT and cybersecurity are best delivered by a well-equipped Managed Service Provider (MSP) or Managed Security Service Provider (MSSP). In a medium-sized small business of 25-75 employees, it is very common to see someone on staff who has an IT title but also provides key support to the organization for delivery of services to their end customer. When faced with the decision of “Do I take care of the customer or update IT security patches,” the customer work almost always takes precedence. This IT person is typically in a reactive rather than proactive mode, out of necessity. A company of this size would benefit greatly from a Managed Service Provider (MSP) or Managed Security Services Provider (MSSP). As a business grows, it require more people, either as employees or trusted contractors to provide key functions and roles in the business. Also, as a business grows, so does its dependence on IT. Keeping the business operational, productive, agile, and secure is essential. When the business leadership asks the questions, “Can our business do____,” whatever the blank might be, IT needs to deliver, in some manner. IT is critical to keep companies in business, competitive, innovative, and continually on the forefront of technology . If IT cannot deliver, it can hinder the businesses ability to stay in business and grow. The challenge for a company of any size is the priority that is automatically assigned to the day-to-day tasks, like jammed printers to get quotes out, or an application not working to process something. Those always seems to take the place of things you should be doing, like risk assessments, security patch management, planning for the best evolution to keep your systems in the best shape for your continue sustainability. It is essential to outsource key functions to make sure you keep up with security, productivity, and competitive innovation to keep you in business! Engaging a Managed Service Provider and Managed Security Service Provider to keep you on track, is a huge benefit. By using automation, they can often do the work more cost-effectively and reliably than you can for yourself, and, free you up to do more immediately impactful tasks for your customers. If you’re a business owner, you know how to run your company. But when it comes to organizing your IT department, the thought can seem somewhat overwhelming. No matter the size of your business (small, medium, or large), it is critical to have a proper structure in place to ensure the functionality of your business, ensure competitiveness in your space, protect assets, and reduce risk. No matter your business size, it is important to keep these tips in mind. Whether you hire an IT Manager, Director, CIO, CISO or the like, your leadership will set the stage for your department as a whole. They will be the ones who are going to play a heavy-handed role in future hires and organizing the rest of the IT department structure. It is critical that this person not only has the skill set to execute some IT tasks but to manage people and ensure that projects are met promptly. It is also essential that this individual be open and eager (although not overly eager to the point of introducing unnecessary risk), to allow your organization to remain competitive. Effective application of technology today is key to remaining the competitive leader in every space. The point of business is most often to grow, either your bottom line or top line. And with that growth, your IT department will require changes. Your IT leader might be faced with having to shift responsibilities and hire new employees to help take on the growth. With an evolving IT department, your leader may also consider promoting and training key employees to assist in managing the growth and possible department expansion, augmenting key roles with external expert resources or sharing recourses with other organizations. These types of decisions may also not be what you want to focus on or have IT leadership focusing on. There are excellent options available for augmenting all levels in your IT stack. For example, you may need a Technical Support Manager, Technical Sales Manager or Software Engineering Manager. This leaves you, your IT leader and other employees free to strategize further, thus, helping you meet your business goals. It isn’t just flexibility with employees that will be required; the ability to understand old, current and future technology quickly and effectively is key. The aptitude of the individuals performing at a high-level in that regard is essential. IT professionals are migrating to talented MSSPs which help several businesses due to the community of the IT team, the ability to work as a team to tackle and resolve complex IT issues, and the comradery to develop with like-interested individuals. IT is more essential than ever that your IT team be open, agile and team minded. There is not a single person in the universe who is an expert in all aspects of IT. If you come across anyone who claims to be, RUN! With more IT innovation at your organization, the IT leader may find it necessary to implement newer security features for your company - people, physical and data assets, and even update software. After all, it isn’t just the IT department growing but the company as a whole which will require more data protection for more employees and customers. The world of technology is ever-changing, and your IT department needs to keep up if it is going to be effective for you and your customers. Your security and that of customers’ is only as strong as your IT team’s ability to stay updated with the latest security threats and how to stop them. Ongoing training for all of your team will help your company keep updated on the latest security techniques. Providing more in-depth cybersecurity training for a few key members can make sense as well. Training today is not a one and done task. It should, however, be completed periodically and can be set up and automated by certain applications such as Sophos Phish Threat. A common consideration today as you decide what to keep for services to be done by your team directly or outsourced to others may come down to your businesses ability to keep IT as a priority. For instance, smaller businesses typically have individuals who may have a certain level of technical aptitude and who either intentionally or over time end up with IT as a side responsibility. This situation can often lead to things that should be done, not getting done and very possibly creating a huge risk for their company. For instance, if security patching is not being done because printer jams continue to take priority, or getting a proposal out the door, then you are at high risk. You won’t necessarily even be aware of that risk until it is too late. Things like this are a priority of service providers such as MSP’s and MSSP’s who make sure that important tasks are not overlooked or not taken care of. Leadership is critical for setting the stage of your IT Department. Your IT Manager needs to posses a dynamic mix of soft skills and technical know-how to execute IT tasks on schedule while managing people. Flexibility is necessary for a growing business and critical for a growing businesses IT stack. Find an IT Manager who is willing to learn and adapt to rapidly changing environments. There isn’t a single person in the world who is an expert in all areas of IT. Many businesses are turning to MSSPs to leverage their diverse expert knowledge base and save themselves a hiring headache. Just because you finished school doesn’t mean you’re done with education. The technology world is ever-changing and your employees need to keep up-to-date with security techniques. More in-depth cybersecurity training should be given to at least a few key members as well. Tasks like security patching are crucial to your security, yet they often go overlooked by in-house IT. More immediate tasks like fixing paper jams, often take precedence. MSPs and MSSPs prioritize tasks like security pathing to ensure your security. As an executive you need to be aware of and understand the critical assets of your organization. You should have conversations with your IT department and supporting MSSP to grasp what measures are being taken by their combined efforts to protect your valued assets. PoE vs. PoE+: What's the Difference?